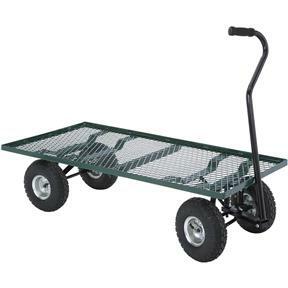 Designed primarily for the nursery industry, this platform truck with extra-large 10" x 3-1/2" pneumatic lug wheels is perfect for just about anything weighing up to 350 lbs. Heavy-gauge grating provides superior strength and support. Tubular steel steering handle delivers plenty of leverage for confident control over a variety of surfaces. 48"L x 24"W x 13"H. Shipping weight approximately 64 lbs.